This is my new favourite place in WA. Its called Shelly Beach, its 40mins out of Denmark and its simply a stunning beach. I took another shot of it from a lookout which I’ll post later. I was just struck with this place the moment we drove down to it and you have to drive down along the cliff face to get there. The surf was great though I doubt I woud ever try surfing there, as I think a few massive bities might be lurking near by. This is my first draft of the photo, but I like how its shaping up. 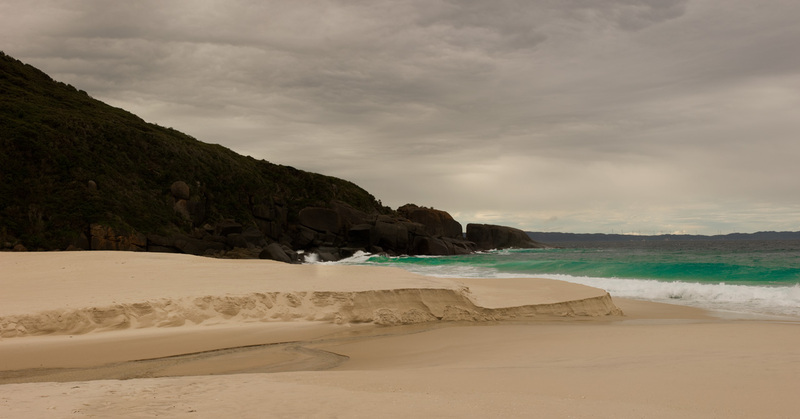 This entry was posted in Australian Landscapes, Beach Photos and tagged albany, australia, canon, canon 1ds mkIII, cliff, denmark, Jamie Paterson, landscape, panorama, panoramic, seascape, shelly beach, south west, stiched, western australia. it is an awesome place. I paraglide there, you may have noticed the launch area on the top of the hill. I did see the launch area. At first I thought it was a viewing platform that had collapsed, but I soon worked it out. It must be magic paragliding off there. Have you camped there? Mark it down for a trip in spring Jamie 😉 Those rocks on the right remind me off a little place in Sydney. It won’t be a spring trip for me as I’ll be a little busy. 😉 Perhaps early summer and I would definitely be interested. I noticed that this photo is a little dark on here so I’ll have to brighten it a bit. BTW my filters are here on my desk. Looks like a great location Jamie. Neal I would love to go on a trip down there in the summer! I love to go on a trip when I get back! I can’t wait to get those filters into action, this weekend.